I built and repaired computers growing up (now 40) in the UK and not once did I wear anything to strop me zapping the bios, memory etc.. My home was fully carpeted in the SE of England. Moved to mid/north sweden 7 years ago. My fantastic Sony Vaio laptop, I zapped 3 motherboards in 2 years :-( Since then, never work without one either PCs/laptops or electronics. My drier here in Umeå, colder. Not really sure what is worse / better. In the 70s and 80s there were still lots of electronics production lines in SE England, and they had lots of issues with static damage in the summer, until they started to effectively control it. The winter is damp enough that the aren't so many natural problems there. However, its easy to create problems with inappropriate heating systems, that make the humidity plummet. I think you got it exactly opposite. When air is cold, it can hold much less water. When air from outside is heated up in the building, relative humidity becomes much lower, even though amount of water in air remains the same. Ah, you'd think so wouldn't you. You make the mistake of assuming that a British boss would do something so effete as to, in winter, warm the area his staff were working in. If you look at curves for static potential generation or static discharge rate vs atmospheric moisture level they are expressed in terms of the relative humidity. For much of the UK winter the outside relative humidity is near 100%, and dew or frost forms most nights as the temperature falls, and relative humidity goes above 100%. Trying to generate a static buildup in those conditions in very hard. Go into a heated building, with no dehumidification system. 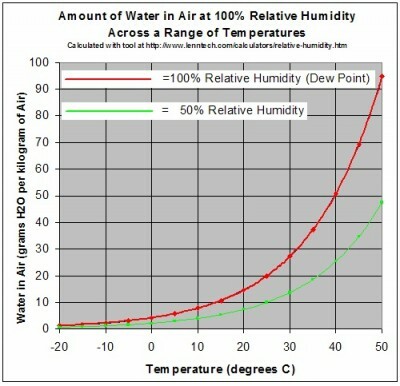 The amount of water in the air is the same as outside, but the relative humidity is much lower. Its very easy to build up considerable static charges in that environment. In recent years I'd say 70% RH, based on my own outdoor readings, was a more typical figure for my little corner of the world (urban East London). The chart says much of the UK is in the 86-88% range. Over large areas the RH certainly exceeds 100% night after night for much of the winter, because there is frost or dew on the ground each morning. If its that high at night and 86% on average, that suggests a typical midday figure might only be 70% or so. That seems lower than measurements I made in North London/South Hertfordshire in the 80s. Typically, 40-70% RH is considered the comfortable range. Winter is certainly characterised by a pretty high exterior RH over much of the country, but heated buildings can drop that figure so much that people complain of the dryness, and wooden furniture often warps. You just basically confirmed what I wrote, and contradicted your post I quoted. If you have 100% relative humidity at 0oC, it becomes 25% if heated to 25oC. So regardless of how damp it is outside, you need air humidification system to keep acceptable humidity level at winter. On the other hand, UK is so damp so there should be no low humidity issues at summer. You just basically confirmed what I wrote, and contradicted your post I quoted. If you have 100% relative humidity at 0oC, it becomes 25% if heated to 25oC. So regardless of how dump it is outside, you need air humidification system to keep acceptable humidity level at winter. On the other hand, UK is so damp so there should be no low humidity issues at summer. What makes you think a UK summer is damp? For most of a UK summer the RH is quite low, and static shocks are common. The RH surges on rainy days, but drops back quickly to a low percentage. A warm UK building, summer or winter, will have a fairly low RH across most of the UK. You might want to humidify the air for comfort. For electronics assembly work the use of things like static dissipative materials and benchtop ioners is generally a more effective solution to static issues. A lot of electronics assembly actually occurs in places with minimal heating, so the RH might be a lot higher than you expect in the winter. Those people most likely do not wear hard hat in construction site, don't use seat belt, data backups or insurance Youtube episode most likely will not change their mind. Some even believe that earth is flat BTW. A lot of electronics assembly actually occurs in places with minimal heating, so the RH might be a lot higher than you expect in the winter. Unless you work at 10oC, you will have low humidity problem. I just found where your table comes from. Those are daily averages. So a rainy July day in London averages 93%. A dry day averages 60%, but the big temperature drop at night means the working day is a lot lower than 60%. That's reasonably dry by static buildup standards. Right. Especially in case when your office/factory is air conditioned but w/o humidity control (as usual), then zapping due to dry air will happen not only winter but summer as well. What makes you think that most assembly shops keep everything heated to even 10 degrees in the winter? Obviously its much hotter than that in parts where soldering and other heat treatments occurs, but it can be damned cold in large parts of a factory. This is BS unless you talk about assembly in Joe's garage. It affects us all in different ways. It can be location and therefore humidity, floor coverings (synthetics) or personally as we are not all built the same so some individuals can be more prone to ESD buildup than others. A mate, a Dr. of EE lecturer tested all students in his class groups and some were advised that a path of handling ESD sensitive components may be not their wisest career path. I would think that a small operation is much more likely to be well heated throughout, as all operations are probably going to be in one room. A large factory is much more diverse. Now you think? Recently you were sure that "A lot of electronics assembly actually occurs in places with minimal heating". So now please tell which large electronics SMD assembly factory(factories) does not follow 20-25oC and 40-65% humidity industry standards. Many would like to know. Even if what you say about RH variation during the day is true (I didn't check that), do you assemble PCBs outside outside or with windows fully open? Or do you see more or less average RH within the building? Also there should be less than around 45% RH to call that a problem. Most buildings in the UK are not air conditioned. On a warm summer's day enough windows are open that they should keep the internal and external humidities fairly similar. At night the closed windows probably create a substantial difference. Static discharges on a summer's day in the south of England can be quite a PITA for many people. To screw up humidity in summer you need some effort to do that (using air conditioner). Low humidity in winter comes naturally because of temperature difference inside and outside of the building. If you have a factory with open windows, you're an idiot. As minimum, you'll get a lot of dust inside. What kind of horrible environments do you have your factories in? Unless there is a specific adjacent dust generator, like a farm, or some awfully messy factory, electronics factories are normally fine with the windows open. Its not like general electronics assembly occurs in a clean room. Obviously some processes need their own special conditions, but not the general factory areas. Most buildings in the UK are not air conditioned. On a warm summer's day enough windows are open that they should keep the internal and external humidities fairly similar. Before you spread your stupid uneducated opinion about electronics printed board assembly factories, at least do some research first - about what it takes to properly manufacture modern electronics. If you have broad experience of electronics assembly around the world, in different climates, it would most interesting to hear your experiences of what those environments are like.